This 25 Year Anniversary Special Edition of The Rifter contains just a sampling of a few of the most popular and helpful articles and source material that have seen print. The Rifter is a source book and tool for Game Masters and players alike. Its is written by fans, just like you, to share with other fans. A unique forum for games to showcase and share their characters, optional rules, adventures, artistry and ideas with fellow gamers. Every issue is unique and informative, and spans the Palladium Megaverse of games and world settings. Index of The Rifter issues #1-33! 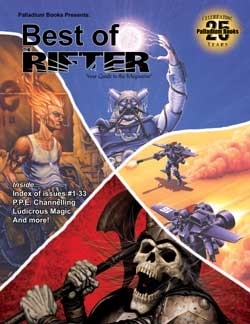 The first comprehensive index and guide to The Rifter ever to see print! P.P.E. Channelling by Jason Richards. G.M. Tips by Erick Wujcik. Rifts - Ludicrous Mage & Magic by Daniel Denis. Nightbane Morphus Tables by Aaron Oliver. 13 Deadly Magicks by James Calder. Three Words by Jason Marker. Into the Shadows by Jon Thompson and more! Plus a comprehiensive25 page index. 128 pages of fun, adventure and ideas!